If you’re the sort of person who enjoys getting up in front of a crowd and belting out Gloria Gaynor’s I Will Survive then this online slot from Microgaming should be of some interest. It’s called Karaoke Party and it should serve as a reminder that whatever you think, you can’t really sing. Read all about it in the review below. 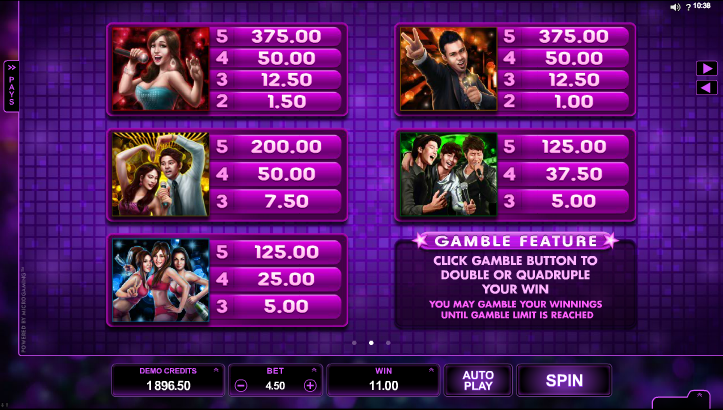 Karaoke Party is a five reel slot with three rows and just nine fixed paylines; the design of the game is quite basic with the reels spinning within a purple frame but there’s a jaunty background tune which should keep things lively – at least until you reach for the mute button. The five high value symbols are shots of various karaoke performers all trying desperately to have a good time; the lower values are represented by the standard 9, 10, J, Q, K and A. The Karaoke Party logo is wild and will substitute for all others except the scatter – that’s represented by some tumbling dice and it’s the key to the main feature. All wins to which the wild contributes are subject to a 2x multiplier. This is triggered by landing three or more of the dice scatter symbols anywhere in view; you will now receive a generous fifteen free spins and the extra good news is that more spins can be retriggered by landing more scatter icons during this round. Each win can be gambled by clicking the ‘Gamble’ button which appears above the ‘Spin’ button; you now have the opportunity to double or quadruple that win by correctly guessing the colour or suit of the next card drawn. Five correct guesses in a row is the maximum allowable. 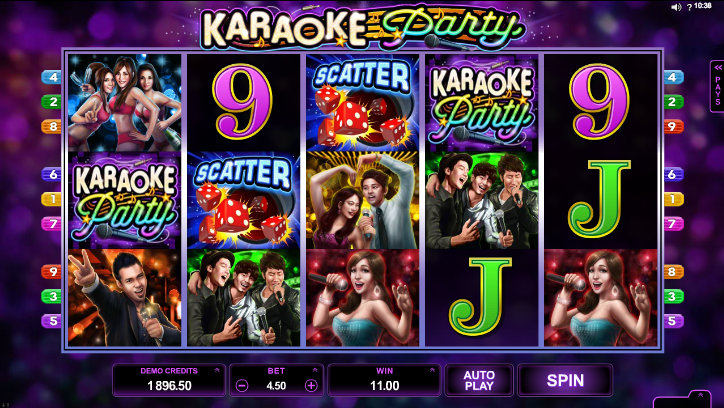 It’s probably fair to say that if you like Microgaming slots then you’ll appreciate Karaoke Party but it does seem to lack a little in imagination and creativity and it follows a very similar design to many other recent games from this company.